Nothing suitable in promotional fortune cookies? 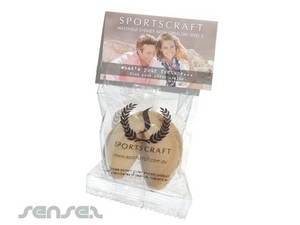 How about custom branded money clips, logo printed corporate nuts & crackers or one of our promotional biscuits & cookies? Hide your marketing message in a fortune cookie. They are fun giveaways, and appreciated. 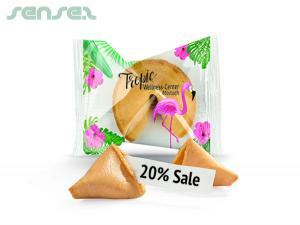 Promotional fortune cookies with your custom inserted message are the ultimate fun promotional give away. They are great for events, where something edible is always appreciated, and the surprise message is one that will be remembered and eagerly anticipated. You can even brand the packaging with your business logo or advertising message! 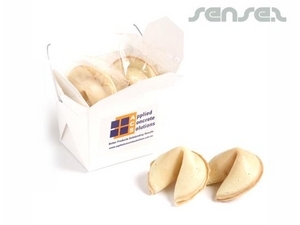 Fortune cookies are definitely a unique business gift that will make your target market take notice. Use them for corporate events or gatherings. 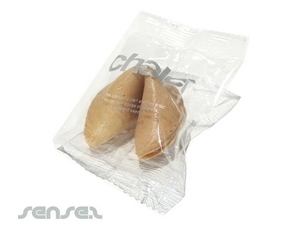 You can insert up to 10 different messages in your custom branded fortune cookies, making it a varied and fun promotional material. For a lasting promotional fortune cookie, choose our fortune cookie shaped keyring, with your custom logo engraved on the tag. 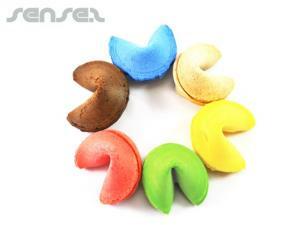 The fortune cookie keyring including branding opens up and can easily hold your custom promotional message.